Commit2clean provide Carpet Cleaning Ascot vale. Our carpet cleaning service is available to all residential and commercial clients across the Ascot Vale. Commit2clean’s carpet cleaning specialists in Ascot Vale can maintain your carpets and ensure a healthy home and office environment. We employ professional carpet cleaners, Our team of experts devises unique cleaning methods for individual carpets in accordance with the area and material of carpets. Clean carpets do not have allergens and dust mites lurking in various corners to infect adults and children health. Our carpet steam cleaning service is available to all residential and commercial clients across the Ascot Vale. carpet & upholstery steam cleaning carpet areas that face heavy traffic are heavily soiled and should be cleaned using steam cleaning. The detergent based solution is applied for a period not exceeding 15 minutes after which the solution is extracted by an automatic cleaning tool. The carpet is thoroughly rinsed out along with residues and particulate matter. 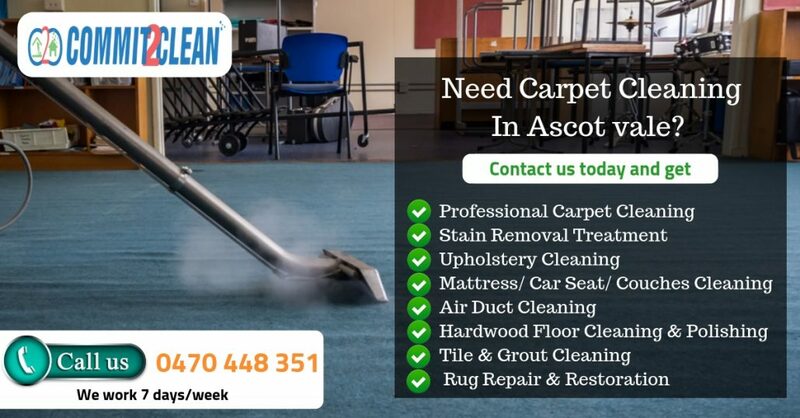 The steam extraction method makes use of more water when compared to other carpet cleaning methods and hence ample time should be provided for complete drying of carpets. Post extraction period is critical to leaving no residues and damp smell. If you want your carpets cleaning or need other cleaning services, you can call us at 0470 448 351 for free estimates and quick turnaround. Arrived on time and did best carpet steam cleaning job so far. Copyrights © 2019 Commit2Clean. All Rights Reserved.